Last admission 1hr before closing. Closed 25. Closes dusk if earlier than 5:30. Closed 25 December. Wild garlic Autumn colour in the garden + views beyond. A beautiful and intimate 18th century landscape garden set in a sweeping valley with magnificent views of the city of Bath. 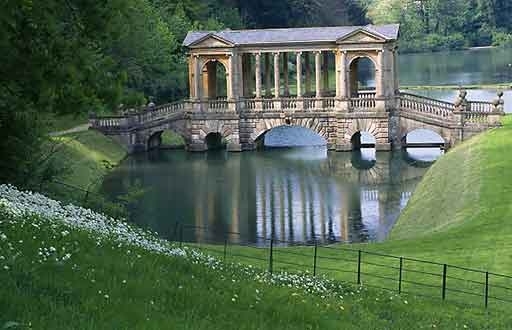 The many interesting features include an extraordinary and beautiful Palladian bridge and three lakes. The tranquil and tree-lined walk around the garden is one mile in length with steep gradients. The Serpentine Lake features a Sham Bridge which gives the appearance to a pool of water of a bridge with stream running beyond. The Wilderness area was developed with the help of Alexander Pope and is currently being restored with the support of the Heritage Lottery Fund. This area includes the Serpentine Lake, Gravel Cabinet and Cascade. Created by the entrepreneur and philanthropist Ralph Allen, (with advice from the poet Alexander Pope), from about 1734 until his death in 1764, this 28 acre, 18th century landscape garden lies in a dramatic site running down a small steep valley to the very edge of Bath. Capability Brown and others provided designs for the garden which was developed over the next 30 years. The Palladian bridge dates from 1755. Taken on and handsomely restored by the National Trust in 1993, it was owned by the Christian Brothers and Prior Park College, who still occupy the house. A fine example of the English Landscape Movement, it forms part of the World Heritage Site of Bath.